The Democratic victory last night in the special election for Pennsylvania's 18th congressional district was an appropriately dramatic cliff hanger amidst the daily swirl of chaos of Donald Trump's presidency. 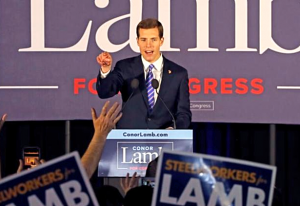 In the state's southwestern district, which Trump won by 20% in 2016, Democrat Conor Lamb, a 33 year-old Marine Corps Officer and former Assistant US Attorney, beat Republican Rick Saccone, 60, by .02%. After the final absentee votes were counted this morning, that came down to 627 votes. In the critical battleground state that helped deliver Trump his presidency, and in a district which the incumbent Republican Congressman won with 60%, the GOP itself tauted this as a referendum on Trump's popularity - which averages 40.7% nationally. Under any other administration, a GOP win would have been a safe bet, but the President's campaigning in what he called "Trump Country" was ineffective in changing the outcome. The 18th CD, which stretches from the Pittsburgh suburbs to the state's rural borders with Ohio and West Virginia, and is home to the nation's largest steel companies, has long been a victim of economic depression. Trump's attempt to appeal to his white working class base through his recent tariff on steel and aluminum imports did little to dissuade the anti-establishment sentiment, which was further fueled by Saconne's record as a four-term State Representative with a strong anti-labor record. While a recount for a statewide election that comes within .05% is automatic in Pennsylvania, there are no rules on the books for its Congressional races. Regardless, the GOP will have five days to file a petition for a recount, which is unlikely to change the results as most voting was done electronically. Saccone will still have a second chance to run for Congress, however, as the Pennsylvania Supreme Court recently threw out the current congressional map as illegally redistricted in 2011. 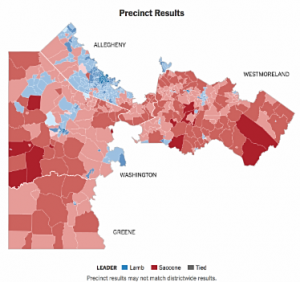 The new map, which goes into effect immediately for the November 6, 2018 elections, puts Lamb and Saccone in two different congressional districts. The final numbers in the 18th special follow the increased democratic voter peformance pattern of the 2017 special elections -- including three where Dems came with 7% points of winning traditionally "red" or conservative districts where Trump had defeated Clinton by 18% or more. According to the Cook Political Report, there are 118 Republican-held congressional districts that are less friendly to the GOP than Pennsylvania 18. All further buoys Democrats' hopes of retaking control of the US House of Representatives, which requires a net gain of 24 seats - once considered an impossible task. There are currently three more special elections scheduled for 2018: Ohio 12 (August 7th), Michigan 12(November 6th) and Arizona 8 (April 24th).